In 2014, the region’s 2,689 square miles, or about 5% of the area of Wisconsin, contained about 2,000,000 persons, or 35% of the state’s population. The region was divided into 154 general-purpose local units of government, including seven counties; twenty-nine cities including twelve of Wisconsin’s twenty-five largest cities (led by Milwaukee with a 2014 population 599,642); sixty-one villages; and fifty-seven civil towns. All participate in the planning process. All SEWRPC plans are advisory, leaving implementation to federal, state, and local governments. State law designates SEWRPC as the official area-wide planning agency for the region. It is certified as the Metropolitan Planning Organization (MPO) for southeastern Wisconsin by the Federal Highway Administration, a prerequisite for federal highway grants. SEWRPC pioneered in combining land use and transportation planning, recognizing that transportation (including mass transit) and urban development are interrelated elements of a single system. To accomplish this, SEWRPC made early use of computers to analyze large amounts of data in developing regional plans. The first and all subsequent generations of the land use and transportation plan (with design years of 1990, 2000, 2010, and 2035) recommended that virtually all new urban development in the region occur in and around established urban centers where transportation, communication, sewerage, and other utilities could be extended. SEWRPC discourages unplanned “urban sprawl,” or formless, low-density development dependent upon automobiles and onsite sewage treatment, as inefficient, costly, and inherently damaging to the natural environment. SEWRPC recommends that prime agricultural land and “environmental corridors” containing the best remaining natural assets such as rivers, lakes, forests, glacial moraines, wetlands, and prairies be preserved. Other SEWRPC plans address water supply, sewerage and sewage treatment, air pollution control, housing, parks and open space, watersheds, airports, and natural areas. SEWRPC is financed by federal and state grants, a special property tax levied on local governmental units by counties, and service agreements, or contracts for special work requested by member governments. Its 2014 budget was $7,588,901. It is governed by twenty-one commissioners, three from each county—one appointed by the county, one by the governor, and one by the governor from lists provided by counties. Its offices are in Waukesha. ^ Southeastern Wisconsin Regional Planning Commission, Regional Land Use Plan Implementation in Southeastern Wisconsin: Status and Needs” Memorandum Report Number 65 (Waukesha, WI: Southeastern Wisconsin Regional Planning Commission,. May 1993), 5. ^ Southeastern Wisconsin Regional Planning Commission, 2014 Annual Report, Fifty-Fourth Annual Report (Waukesha, WI: Southeastern Wisconsin Regional Planning Commission, July 2015): 3-5. ^ Wisconsin Statute 66.0309(8) (b). ^ 23 CFR 450 (Code of Federal Regulations). ^ Southeastern Wisconsin Regional Planning Commission, Recommended Regional Land Use and Transportation Plans, 1990 (Waukesha, WI: Southeastern Wisconsin Regional Planning Commission, November 1966), and subsequent plans. In 2015, a fifth generation plan with a design year of 2050 was in preparation. ^ Southeastern Wisconsin Regional Planning Commission, 2014 Annual Report, 6-7. ^ Staff Directory, Southeastern Wisconsin Regional Planning Commission website, accessed September 3, 2017. 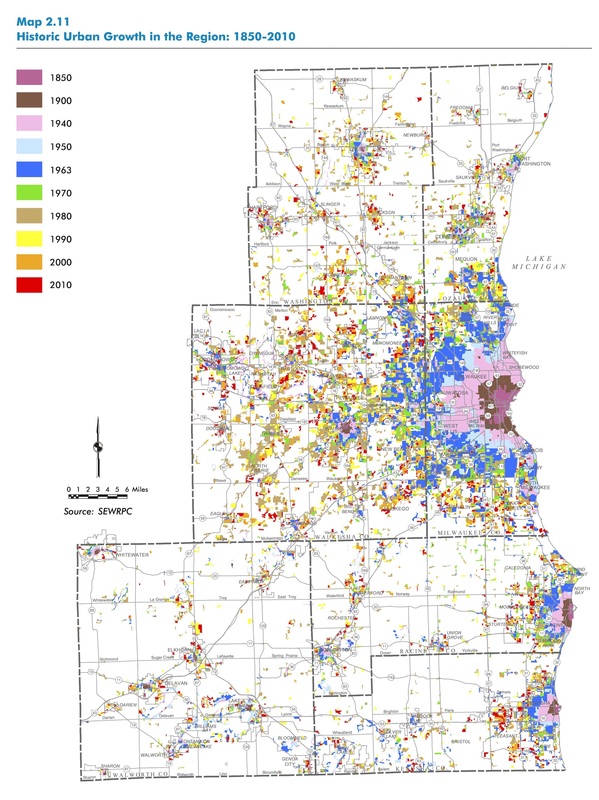 Hayes, Paul G. Master Planners: Fifty Years of Regional Planning in Southeastern Wisconsin: 1960-2010. Milwaukee: Marquette University Press, 2010. Southeastern Wisconsin Regional Planning Commission. A Regional Land Use Plan for Southeastern Wisconsin, 2035. Waukesha, WI: Southeastern Wisconsin Regional Planning Commission, 2006. Southeastern Wisconsin Regional Planning Commission. 2014 Annual Report. Waukesha, WI: Southeastern Wisconsin Regional Planning Commission, July 2015, last accessed September 3, 2017.